The formation of this particular post like many things is an accumulation of thoughts based on what ive recently heard and read and which got me thinking.. On this occasion the catalysts were a post in a Linkedin group I subscribe to and an article i had read. The subject which pricked my interest was the concept behind an often used phrase which to me is very easy to say but maybe not so easy to put into practice. That phrase is Keep(ing) an open-mind as in “Im going to keep an open-mind on this”. Open mindedness features heavily (and rightly) in what is known as the PEACE system of investigative interviewing as a means of evidencing impartiality and a move away from a more close-minded coercive “we know you did it” approach. Open-mindedness in such circumstances is equated with transparency,openness, positivity and cooperation. 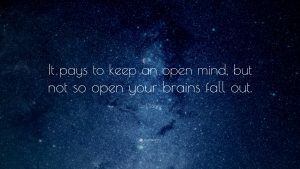 However is it actually possible to be unconsciously open minded or do we need to constantly consciously remind ourselves not to close our minds simply because open mindedness is actually really hard to sustain. The term “cognitive miser” coined by social psychologists Susan Fiske and Shelley Taylor (Social Cognition -Addison-Wesley Pub. Co.1984 ) proposes that our brains are always seeking shortcuts to lower our cognitive load and allow us to process information more efficiently – in other words closing our minds down.One of the result of the process of shutting out information in the name of efficiency is bias. In terms of investigative interviewing, bias and in particular perceptional bias is seen as the polar opposite of open-mindedness as it closes down the brain causing preconceptions based more on the subject than the circumstances. Now, I totally agree with this 100% but my question is can we really be totally open minded especially in high stakes situations? Well, recent research undertaken at the University of Chicago ( Ottatio V, Pricea, E, Wilsona C, Sumaktoyob – When self perceptions of expertise increase close minded cognition – the earned dogmatism effect 2015) throws up an interesting proposition, that being, that the more “expert” we become in a subject the more close-minded we become to alternate perspectives.So consider this in the terms of that investigative interview when we have followed the PEACE (or any other) model and employed a tactical approach collecting and assimilating all the available information to put us in a position of strength – making ourselves in effect an expert on the case. How difficult will it be to nullify our cognitive miser and work against our brains natural operating processes? The documentary series focuses on the investigation and more relevant to this post the methods used to extract a confession from the individual suspected of the crime Steven Avery. The article does not however focus on what at the very least appears to be close-mindedness bias on behalf of the investigators but instead draws comparisons between this and the “investigation” by the film makers Laura Ricciardi and Moira Demos. “….we still have not thought seriously about what it means when a private investigative project—bound by no rules of procedure, answerable to nothing but ratings, shaped only by the ethics and aptitude of its makers—comes to serve as our court of last resort”. In short the thrust of the article is that by trying to build a case about a miscarriage of justice they themselves fell into the same traps. Are we asking too much of individuals who are often investigating horrific incidents to not have thoughts and opinions and to be totally open minded? Or is it just down to what in such situations open minded means?